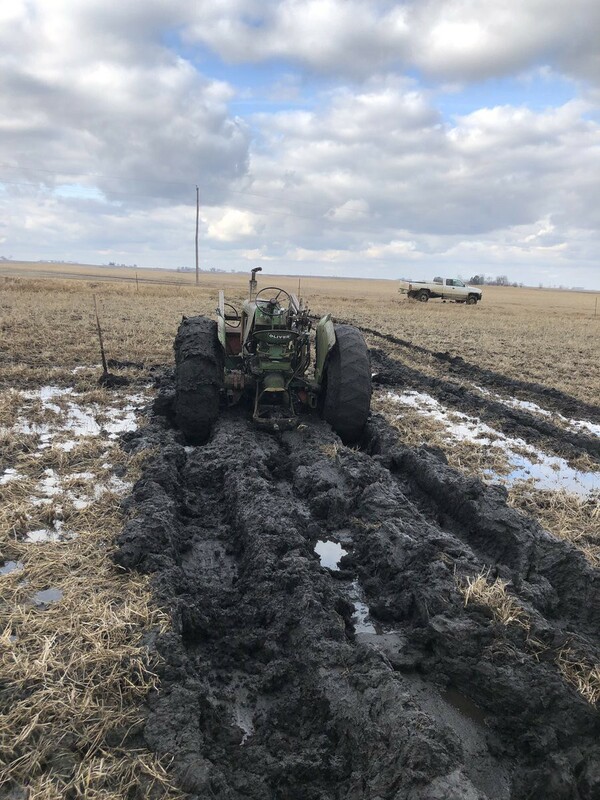 Iowa Farmer Kevin Dietzel got his tractor stuck in the mud this week. Twice. Sorry, Kevin, but thanks for sharing the photo with the world. Good luck during spring mud season, buddy. Rural Iowa Facts and Figures. Longform Style. A longform guide to rural Iowa, with data points and potential sources for out-of-state journalists covering the circus (I mean, caucus). When you come from a marginal agricultural region as I did, the kind of place where most of the topsoil has already migrated downriver to become part of ecological Louisiana, there is a mix of awe and jealousy toward those places blessed by the gods of fertility and loess. When I was growing up, that place was Missouri’s neighbor to the North: Iowa. To many Iowans, Missouri is the land of freedom where you can take a daytrip drive-around for easy access to fireworks and other explosives. But to a Missourian, Iowa is the place where 200-bushel corn is a birthright rather than a miracle. When a resident of the Show-Me State crosses the human-drawn invisible threshold into Iowa, the roads suddenly become smoother, the fuel more expensive, the schoolyard playgrounds safer. Sometime in the vicinity of 2003-4, I was in a meeting with about 60 livestock farmers thanking Senator Charles Grassley (R-IA) for his leadership during the previous farm bill debate, and urging Grassley to keep up the fight to ban corporate meatpackers from owning livestock. The amendment passed on the floor of the Senate, but was ultimately removed through the conference committee process. Grassley, already old and that was 15 years ago, was wearing a fancy pants suit while committing to stand for fair and competitive markets for independent livestock producers. My buddy turned to me and said, “Man, check out those slippers on that guy. Did he just wake up?” The U. S. Senator was indeed sporting some sweet slippers. I smiled and pointed down at my own feet. I was wearing house slippers as well, but nobody notices when you’re a 25-year-old community organizer that regularly wears house slippers like a Missouri bumpkin at inappropriate times. I was mostly surprised I had much in common with the old man other than the packer ban. In June 2001, I was visiting a friend at a shack he rented about 45 minutes west-by-southwest of Iowa City. He told me to bring my fishing pole. At this farm pond he had permission to fish, we caught approximately 200 crappies apiece in 90 minutes and I’m not even joking. So while Missouri probably has more crappie per capita, Iowa contains Crappie Heaven (or Crappie Mecca, I don’t have a preference what you call it). I don’t know if I’ve ever been more joyful in my life during an hour-and-a-half timeframe. I spent Halloween night of 1998 walking around Iowa City bars and parties in a gang of dudes dressed up as the Village People. I was the one in military fatigues, which is probably the most ironic thing I’ve ever done. I don’t remember much of the night, frankly, but fun was surely had. Several men asked me to go on a date, which was both surprising and ego-stroking. It also made my wife laugh a lot, and that’s always a good thing. One time I was attending a friend’s hog roast in Des Moines. It was a Catholic Worker-type house with lots of anarchists and scoundrels of various kinds attending. Given that the tasks at hand were feeding a fire, barbecuing a whole hog, helping to carve the meat, drinking beers and bourbon and talking smack with good people that disagree fundamentally with wealth accumulation, that was also one of the grandest days in my life. I woke up the next morning in my car and some nice Iowan had covered me up with a blanket so that I wouldn’t be cold. This was an act of generosity, especially considering that I had probably said something offensive in her/his presence a few hours earlier. Thanks for the blanket, Iowans. I’ve also had a personal tour of the La Quercia artisan charcuterie facility, consumed enough Maytag Blue Cheese to account for a third of my extra poundage, eaten at the Drake Diner often enough I don’t need a menu and think that Art Cullen is a smarter, more effective writer than any jackleg Ph.D. hired by the New York Times. My wife has ridden in Ragbrai. I have thrown a 7-over-par round of disc golf at Peninsula Park DGC. And Casey’s Taco Pizza is one of my top ten comfort food choices. See? I know a little bit about Iowa. Regular readers and personal acquaintances know that one of my hills-to-die-on is using information and data to inform better policy decisions, usually having to do with rural topics. Since Iowa is the “rural” standard-bearer when it comes to rural=agriculture proponents, let’s take a look at some numbers. Iowa has 3,145,711 residents statewide. In 2018, Iowa had a per capita personal income (PCPI) of $48,823. This PCPI ranked 28th in the United States and was 91 percent of the national average, $53,712, according to the Bureau of Economic Analysis (BEA). Iowa ranks 1st in the U.S. in corn and 2nd soybean production among states. Iowa produces 257 million pounds of cheese per year. Iowa contains 22.8 million hogs (almost 32% of the nation’s hogs), 4 million cattle, 165,000 sheep and 60 million chickens in Iowa. Iowa has 55,875 square miles of land. Over 85% of Iowa’s land is used for agriculture. Iowa’s 43 ethanol plants have a combined annual capacity of 4.1 billion gallons of ethanol annually. Iowa produces more than 30% of the nation’s ethanol. According to my index of rurality by state, Iowa ranks 12th in percentage of rural population (35.98%), 24th in number of rural residents (1,096,099 rural Iowans) and 21st in rural population density (20 rural Iowans per square mile of rural land). In terms of recent economic trends, Iowa’s rural counties are seeing a mixture of job gains and job losses since 2008. (See clickable map by county created by Bill Bishop at everybody’s favorite rural website, the Daily Yonder). Iowa is certainly an agricultural powerhouse, but a similar number of rural Iowa counties have economies driven by manufacturing (again, props to Daily Yonder for generating this clickable map documenting dominant industries by rural county). Lots of rural Iowa is in the “mixed economy” category. In the 2016 election, Iowa went solidly for Donald Trump. Only 7 of 99 counties had a majority vote for Hillary Clinton. Barack Obama won Iowa in both 2008 and 2012. These statistics are not meant to minimize the role of agriculture in the state. Far from it. Corn, oilseeds and livestock are ingredients for the manufacturing sector. But most politicians and pundits have an agricultural superiority complex, a flawed view that I very much dislike. It’s possible to, like me, be pro-rural and pro-farmer while also understanding that farming is the 8th most important industry in a state instead of stomping around saying “we’re number one” all the time. A little humility, please, Iowa Farm Burea et al. We hear you, but sit down. In terms of the energy sector, Iowa has invested in wind and solar production more than most states of similar demographic makeup. Though still reliant on coal, the Iowa Environmental Council reports that the state produces 36% of its energy by wind. “Iowa also ranked second nationally in the amount of wind energy installed with 6,952 megawatts (MW) at the end of 2016. Wind power directly and indirectly supported 7,000 to 8,000 Iowa jobs in 2016 and accounts for annual land lease payments to landowners of between $20 million and $25 million. The total capital investment in wind energy is at least $13.5 billion,” the Council states on its website. I have previously reported on Iowa’s clean energy economy, once again for Daily Yonder. Rural Iowa has 13,567 clean energy jobs, 2,564 renewable energy jobs and 8,714 energy efficient jobs, according to the report, “Clean Energy Sweeps Across Rural America.” That amounts to 2.5% of the state’s rural employment compared with only 0.5% of employment in the fossil fuel sector. That’s a 5x difference in favor of clean energy jobs compared with fossil fuels. In terms of racial diversity, rural Iowa is pretty white. But, Iowa is home to more than 150,000 immigrants statewide, 6% of the state’s employed workforce according to New American Economy. The brownest parts of rural Iowa are the meatpacking communities, where 12,228 immigrant workers earn their pay, 38% of the 32,290 total workers employed in meatpacking. Like a lot of rural states, Iowa has excelled at exterminating its native peoples via land theft and genocide. The state does have one federally recognized Native American tribe. That’s the Meskwaki Nation, commonly referred to as the Sac and Fox Tribe of the Mississippi in Iowa. The Meskwaki Nation is located near Tama along the Iowa River. Sorry, Iowa. It ain’t all roses and cantaloupe chunks wrapped in locally-raised prosciutto. Speaking of sorry, Iowa, when you’re the tech and innovation hub for monoculture rowcrops and CAFOs there’s going to be some problems. For those who might not speak Corn Belt, “monoculture rowcrops” means that most of the state’s acreage is dedicated to producing corn and soy while attempting to kill off every other plant and bug in the field. “CAFOs” is both the acronym and the legal/policy term for Concentrated Animal Feeding Operations. Many people call them “factory farms” in the local parlance, but I’ve also heard “pigshit factories” as well. CAFOs are, and I’m going to use some generalizations here for the sake of simplicity, large metal buildings packed with thousands of animals that never go outside flanked by large manure ponds with limited, if any, waste treatment equipment. A lot of CAFO promoters would rather talk about “modern farming practices” or “Feeding the World” or “thanking farmers for their service” instead of admitting that concentrated animal manure is a manmade disaster risk with a track record of negative impacts on local water, rural communities, climate and public health. They’re a sensitive group, and a politically powerful minority, that is easily offended by the term “factory farm.” The CAFO industry likes to pretend they’re under constant attack from vegans and activists, as well as “burdensome government regulation.” The truth is that lots of people fighting for fewer CAFOs and accountability for pollution are rural Iowans, many of them livestock farmers. But, it’s probably easier and more effective to run a we-love-CAFO marketing campaign focused on dark-skinned female lesbian Mexican vegetarians trying to take away your cheeseburgers (that one’s for you, Fox News). The Explosion of CAFOs in Iowa and Its Impact on Water Quality and Public Health. Iowa Policy Project. How America’s Food Giants Swallowed the Family Farms. The Guardian, March 9, 2019. What is a Factory Farm? Iowa Alliance for Responsible Agriculture. The real reason I wanted to write this post was to list out rural-oriented people and organizations to hit up for additional information and analysis. This is a non-authoritative list of sources presented in no particular order that I would recommend to anyone looking for Iowa’s best and brightest rural voices. You know, because of the outside chance that some journalist looking for research and sources comes across this post. And no, Tom Vilsack, you didn’t make the cut because I’m still mad at you for some things, both past and present. Iowa CCI — Iowa Citizens for Community Improvement is a grassroots group fighting for family farms and rural communities. They challenge CAFOs, welcome immigrants, fight for better wages, work for fairer housing, challenge big energy, etc. Hands-down some of the best, most effective community organizers in the biz, particular in rural. They’re not everybody’s bag because they are fierce and aggressive about fairness and justice and democracy. That doesn’t bother me. A lot of people don’t like me for similar reasons. Chris Clayton — Clayton is the best agriculture reporter I read and follow. He’s the DTN Ag Policy Editor and lives in Iowa. If you’re not reading Clayton’s reporting on federal agriculture policy and more, what are you doing with your life? He makes Beltway farm journalism informative and accessible. Women Food and Ag Network — WFAN is a community of women in sustainable agriculture. Though national in focus, some of the staff are Iowa-based. Their mission is “to engage women in building an ecological and just food and agricultural system through individual and community power.” Badass women like these are the leaders we’ve been waiting for, rural America. So let’s get out of their way and open our ears to their opinions, please. Center for Rural Affairs — a non-profit group that says, “We are unapologetically rural. We stand up for the small family farmer and rancher, new business owner, and rural communities.” CFRA is technically Nebraska-based, but also has lots of Iowa members, an office and local portfolio of work. I count on them for expertise on numerous rural policy issues. Art Cullen — Art Cullen’s website says that he “is a Pulitzer Prize-winning journalist, editor of The Storm Lake Times (a family-run weekly newspaper in small-town Iowa), and author of the new book, Storm Lake: A Chronicle of Change, Resilience, and Hope from a Heartland Newspaper.” I’d like to let him buy me a beer someday and listen to him tell stories. The Leopold Center for Sustainable Agriculture — The Leopold Center at Iowa State University was created through the 1987 Iowa Groundwater Protection Act. The Center’s goals “are to identify and develop new ways to farm profitably while conserving natural resources as well as reducing negative environmental and social impacts.” Groundbreaking reports on Food Miles, Hoop House Hogs, Ag of the Middle and much more. Some jerks in the Iowa legislature have defunded the Leopold Center, and that upset me so much I wrote about it. (See my Daily Yonder commentary at this link “AS INTEREST IN SUSTAINABLE AG SOARS, IOWA LEGISLATURE KILLS RESPECTED RESEARCH CENTER”). Iowa Policy Project — Want some Iowa policy wonking focused on tax and budget, energy and environment, and economic opportunity issues? These are your people. Great source for data-driven analysis and commentary. I’ve heard David Osterberg, one of the IPP folks, give some talks and that dude rocks. Seed Savers Exchange — you might think I only spend my time reading, typing and spouting off about policy. Well, I’m also a gardening nerd. SSE is a nonprofit seed company that “aims to conserve and promote America’s culturally diverse but endangered garden and food crop heritage for future generations by collecting, growing, and sharing heirloom seeds and plants.” Heirloom gardening royalty, pure and simple. I’ve never been to their home at Heritage Farm, which is one of my greatest regrets in life. And now I live in Washington state, so the chances of this regret growing are increasing with time. Backcountry Hunters and Anglers, Iowa Chapter — BHA is one of my favorite sources for insight into conservation issues, public lands issues and all things outdoors. The Iowa Chapter recently formed and could probably use your support and participation. Iowa doesn’t have a ton of public land compared to some rural states, but this group’s mission is “to protect and enhance Iowa’s existing public lands while expanding opportunities for hunters and anglers within the state.” Sounds good to me. Iowa Water Center — IWC is a federally-funded research center focused on water quality, water quantity and the human dimensions of water-resources management. IWC is an unbiased source that “disseminate information about Iowa’s water resources to water-resource specialists, teachers, students, policymakers, and the general public.” Their blog, H2 in the knOw, is great. I’d be remiss if I didn’t do a bit more Iowa name-dropping while I’m on a role. I’d tell you that three of my favorite humans are the Iowa farmer George Naylor, the singer-songwriter Greg Brown and the Iowa City environmental educator Zac Wedemeyer (founder of Taproot Nature Experience). Also, it’s a well-established fact that I can whup Hugh Espey in both a wrestling match and a footrace. The law-dog and writer Nate Rosenberg might make the cut someday, but I’ve never met him in person so I can’t tell if he is as cool as he seems on Twitter. And last but not least, two of my heroes are Henry Wallace and Carrie Chapman Catt, Iowans in the Ancestors’ Club of Awesome Americans (the ACAA). If I’m forgetting someone, I apologize in advance. Now that I’m thinking about it, this list is way too male-centric, but I guess that’s revealing in a lot of ways. It’s also embarrassing. Sorry female and LGBTQ Iowans. I’ll try to be better in the future. I wish I knew some of you better. This is getting too long. I’ll just say here’s to you, Iowa, and I hope you make it through the next year of political activity without losing your awesomeness. Good luck sorting the wheat from the chaff in this ridiculously crowded field of candidates that could possibly replace the Head-Golfer-in-Chief. If nothing else we’re counting on you to make these jokers talk about more than their safe votes on the farm bill! Let’s dig into real rural issues in 2020 in Iowa, even if you’re actually 2nd place to California in agriculture and you’re “less rural” than New Hampshire. We still love you. Rural Policy Diary is an experiment in sharing data, concepts, ideas, frustrations and analysis that emerge from my rural policy reporting. My core concerns are economic justice, the ecological and climate crisis, rural wealth and labor extraction, public ignorance of rural diversity and the games that politicians play to distract us all. I use this platform to organize my thoughts and catalog information that isn’t published elsewhere. My attempt is to present credible data and information in an amusing prose format. Rural policy data and info. Smartass prose. Economy. Ecology. Equity. Inclusion. Diversity. Humility. No gaslighting. No billionaires. No deniers. No empire.